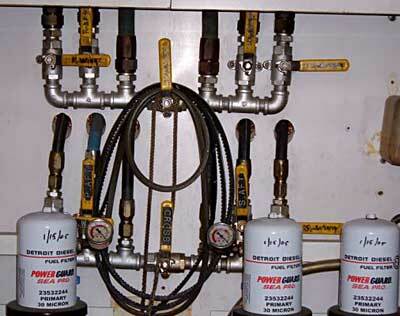 The detroit filter system, tank valves and the oil change system. Pressure gauges let you know of any fuel restriction. 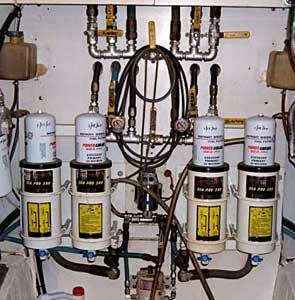 The boat has three fuel tanks. (2) three hundred gallon tanks are located forward of the engine room bulkhead, one on the portside of the laundry room, the other on the starboard side of the master closet. The third tank, a 400 gallon is located in the cockpit. These valves determine from which tank the engines are drawing. Unfortunately, the boat is normally run using the aft tank, which leaves the two sadle tanks holding the same fuel for extended periods. We intend on configuring a system to filter the fuel in these tanks while at the pier so there won't be a problem when we're at the Canyons 90 miles out.